A working year is less hard every time I remember that I will have four days in Paradise in August. It’s my third year at FATT Festival (Didgeridoo Festival) and it certainly won’t be the last. The place (Sítio das Fontes), the environment, the people, everything is magical! The festival has a lot of activities, for all tastes, during the day, and concerts at night. The weather is really hot but the natural swimming pool with fresh water helps a lot. The food trucks sell mostly vegetarian food. And it’s important to know that this is a festival suitable for children. The stage, which is turned to a beautiful outdoor amphitheater, opened the first night with a Jam Session. Those who wanted, could go up there and show their gifts to everyone. Tomás Carro was next with his didgeridoo and hang. 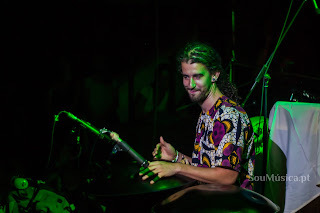 João Jardim, with the same instruments, finished the night with almost everyone dancing in front of the stage. The second day started still with lots of people coming for the weekend. The workshops started in the morning and we went to a djambé class. After a great vegetarian lunch, I spent the afternoon in a phytocosmetic workshop where I learned the steps to start the preparation of each product. The afternoons where very hot so everyone spent them near the water. The soundtrack is constant in FATT, there are several jam sessions formed everywhere so we can hear all the time djambés, didgeridoos or people singing. The second night of concerts began with Turbodzen, a duo from Russia. 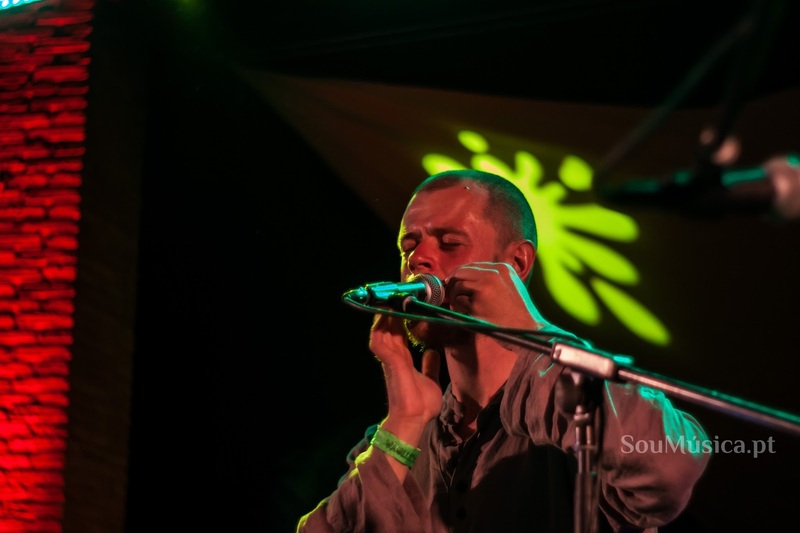 With each one using only a mouth harp, they gave a full concert that filled the stage with a huge sound despite the small instruments. The group Transmongolia was next. Like the name says, they came from Mongolia, with traditional clothes, to show us the sound and instruments of their country. A beautiful concert that ended with everyone singing along. Ab Origine, an Italian duo, were the last concert of that night. 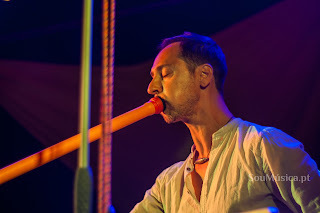 With a didgeridoo and a lot of percussion instruments they made everyone dance bringing some influences and instruments from other countries, with a sound like Trance music but in an acoustic form. Saturday started rainy, not a bad thing for people who are sleeping in tents in such a hot place as the south of Portugal is. The day, as usually, was spent amongst activities, socializing and having fun. I was able to finish my phytocosmetic apprenticeship . We made a massage oil and a lip balm. Everything was 100% natural, of course. The sun set with the sound of Sage, the artist from Russia who brought to us his experimental music. With a didgeridoo and some loop stations, he helped us travel. The travel continued with Kabeção & Mayuko on Hang. A really peaceful and beautiful concert (perhaps the one I liked the most) that the audience listened attentively. The sound of Hang is very delicate and has been gaining a lot of fans lately. Dubravko Lapaine, from Croatia, was the next artist. He brought not only music but a message as well. Only with didgeridoo he played and delighted everyone. 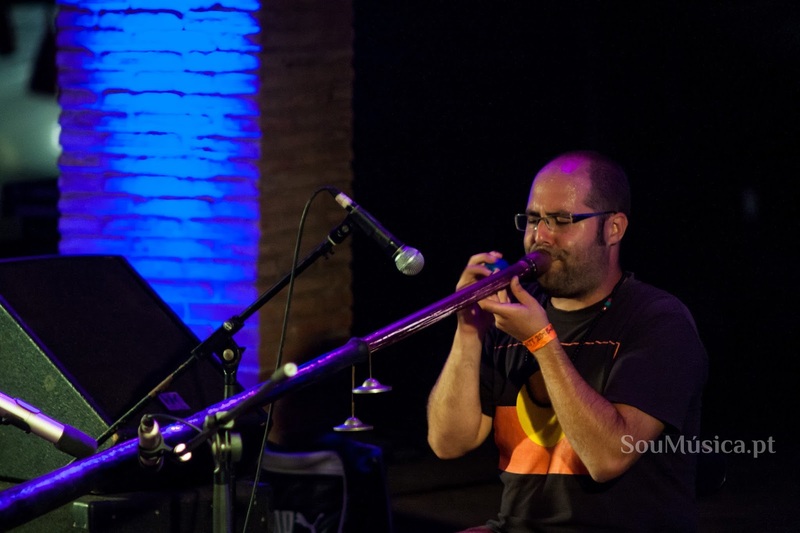 To finish the concerts, the band Muscaria Psico Waves, from Spain, went on stage. With a mask and a initiation ritual they set the public on fire for the last night. A mix of different styles and instruments that ended in a really positive note the 2015 FATT Festival. The last day, or the last morning, is always sad. The goodbyes are needed but it’s only a "see you next year!" Can you talk a little bit about your project? It’s a solo project now, where I use some electronically devices to combine sounds and to make some effects. 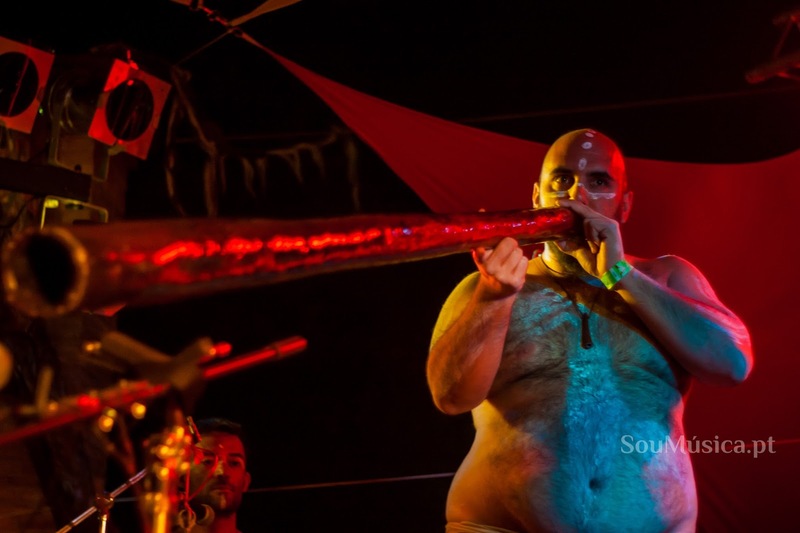 I come to FATT Festival as a didgeridoo player mostly but with different sounds as well. I also have a different musical program where I sing some songs, traditional Russian music but there you need to understand the meaning of the words, so you need to understand the language. The festivals and the travels help you in the composition? They bring good opportunities to communicate but when I need to compose I need to be by myself, moving but inside me. What are you thinking about the festival so far? The organization, Ricardo and his team, they were very kind and helpful along the day. It’s a very nice place. It’s my first time in Portugal, it’s different from Russia but you can find something close to this in the South next to the Black Sea. It’s difficult to put in words. The art express what words can’t explain. When you play something you can feel some emotion but for others can be a different one. In different situations you can also play the same music, same song but with different feelings. Is the didgeridoo common in your country or is more alternative? It’s more experimental music. Modern instruments are very complex but didgeridoo is very simple at first sight and sometimes it’s difficult to make it unique and different. I like to use some devices that help me fill the sound. 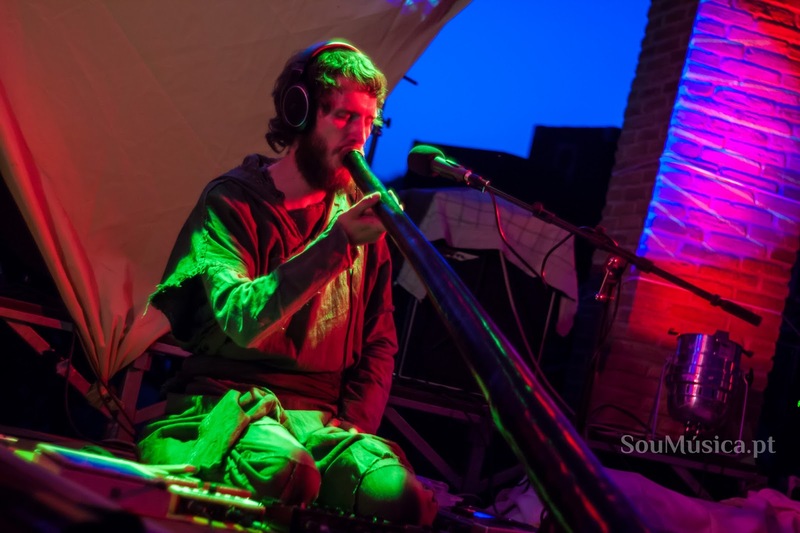 How did you get in touch for the first time with didgeridoo? I met some guys, one of them was playing this “stick”, he wasn’t very expert in playing it but for me the sound was very new and unique. He had brought it from the States. At that time I was playing guitar and rock but I was passing through an artistic crisis because I thought everything was the same. The didgeridoo has a unique sound, simple but complex. For people that don’t know you, who is Ab Origine? GP – We come from Italy. I started to play didgeridoo a few years ago in a solo projects. Then I started to develop the Ab Origine project in two different directions, with other musicians that I met in jams and with Mario in this duo. We met two years ago and we developed some tracks that I already had. We have now a brand new show and a brand new album, “Keeping the wire”, that we are here to present. 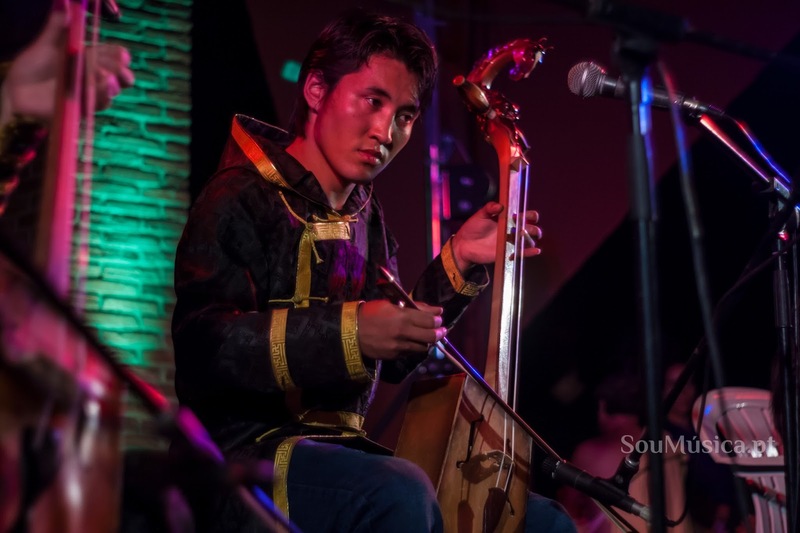 MF – This project is a mix of sounds from instruments of different parts of the world. Modern didgeridoo and my modern cajon. 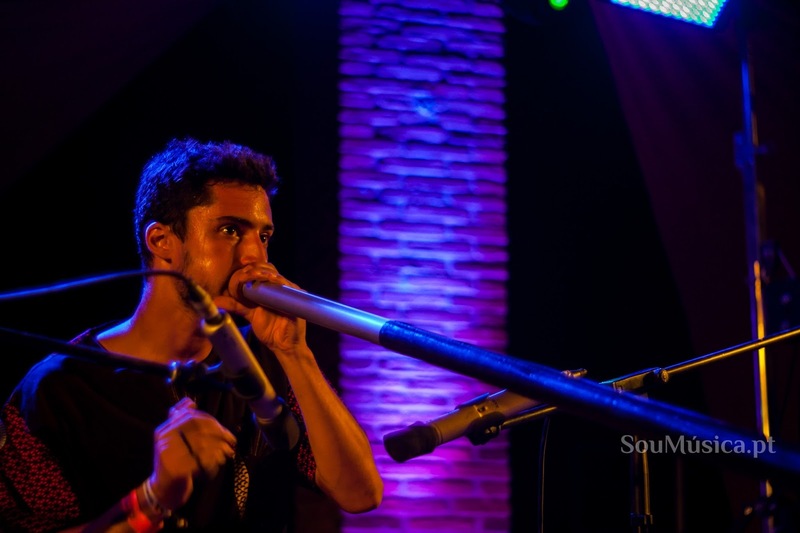 It isn’t a traditional didgeridoo and it’s a modern style of playing it. And my (cajon) it isn’t traditional flamenco or Peruvian music, it’s another style of cajon, similar to electronic music but with a lot of elements from traditional music around the world, for example I’ve studied Brazilian music and in some songs I introduced shaker and bongos. How did you get to that cross of cultures and musical genres? MF – With a lot of passion. GP – With travels too. For example I love Indian music and we made a song that is a tribute to Shiva, the dancing God of chaos and destruction. We have songs with influences from India, Afro-Cuba, etc. But for me is not only mixing different cultures, it’s important to have a transversely idea. It’s important to find something that cross the cultures, a human meaning that can unify all together. I want to transmit something that everyone can understand despite their culture. GP – Not totally the sound but more in the idea behind the project. GP – Yes, our name it’s not from the aboriginal culture. It’s Latin and it means “from the beginning”. The beginning from all of us. What are you thinking about this festival? MF – It’s a really nice festival, smaller than usual but really really nice. I’m very relaxed. GP – It’s very friendly. And well organized to. GP – That people dance and enjoy! For our readers that don’t know you, what can you explain about your project? I come from Croatia and I devote my life to explore the possibilities of didgeridoo. I pretty much left everything in life; I was a mathematician before and I worked in a University. 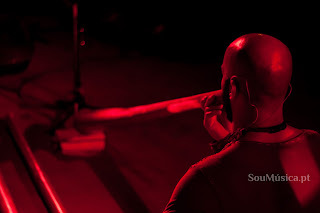 Eight or nine years ago I left everything, I started to play many hours a day, I was very disciplined and that led me deeper and deeper in the vastness of didgeridoo sound and I realize there are so many possibilities that I never considered. How did you get in touch with didgeridoo and that culture? I discovered the “tube” in a shop in Zagreb, where I lived. I don’t know why but I was always returning to that tube even I didn’t know what was used for. Almost every day I returned to the shop and something pulled me very strongly. It was before internet so the information was spread in a different way. I never thought at that time that I would become a professional musician one day. The didgeridoo culture in your country is common or is it more alternative? No, it’s not common anywhere. The didgeridoo culture is very ancient and it is now becoming a very fresh instrument. It’s an instrument that brings you freedom but in the 80’s and 90’s it was attached to a more hippie culture, so it was not very well advertised. So it isn’t mainstream anywhere and in order to become more popular the whole consciousness need to change. The endless possibilities. When I was in the mathematics I never felt that I could have an impact on the world but with the didgeridoo I already feel my impact in the world. My inside inspiration is more like meditation, but when we give it a name it lost meaning. It’s a way to find home within. The instrument guides me so I don’t need to read books in how to do it, the only thing I need to do is to do it. What are you thinking about FATT Festival? I feel at this moment is the right place to be, the energy is rising. The energy of the didgeridoo world entered in different countries at different times and in waves. First you have a rising wave and then it drops, and so on. In Portugal didgeridoo story started relatively late so now the wave is still rising. The place is beautiful and people are beautiful. I would like to know when did you started to have contact with didgeridoo. It was in 2007 at MEO SW Festival. There was a shop with musical instruments and there was a didgeridoo. In the night before Blasted Mechanism had performed and they use didgeridoo. I really liked it and in that shop I ended up buying one. Life. Each moment inspires me. 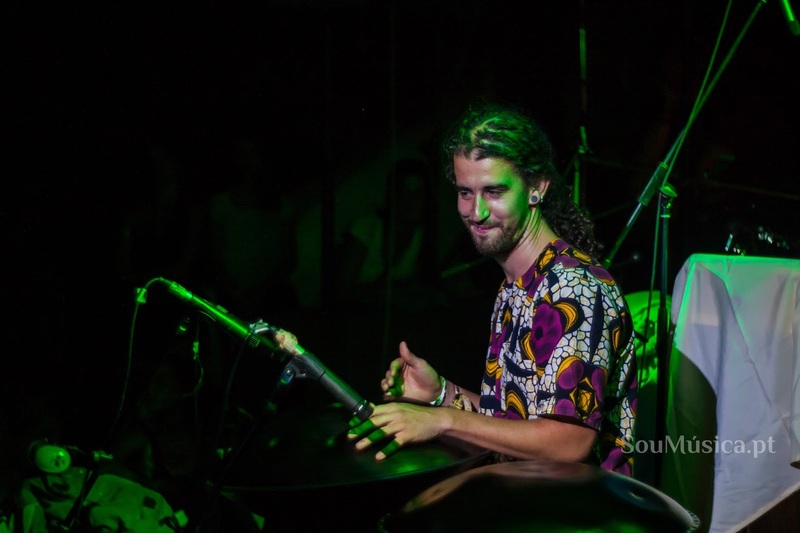 What do you think about FATT and what it brings for didgeridoo culture in Portugal? FATT for me is one of the best festivals in Portugal. First because is very familiar, people come for the same purpose, it’s all about didgeridoo and it brings people together with the same ideas. It’s also a festival very interesting at a musical level. I started to come seven years ago and never missed one edition and I’ve been playing the last six editions. I try to pass my essence, share a little bit of me. The message also depend of the moment, my shows are really spontaneous. It depends on the energy of the crowd, the people that I’m playing with, … The message is always different. Tonight you will play alongside with another artist. What can we expect from that concert? Are you going to improvise a lot or it’s everything more or less arranged? We arranged to have nothing arranged. But it will flow. How was the experience of the television program that you were in (Got Talent)? It opened a lot of doors for me. People today recognize, I’m a street artist and I play in other festivals abroad. But after the show people started to acknowledge my work and I have been receiving lots of invitations and lot of love. How did you start to have contact with the aboriginal culture and the didgeridoo? Well, my first contact with the aboriginal culture was through documentaries from National Geographic in Odisseia channel. But it was only in 2007 that I heard and saw a didgeridoo for the first time, it was in a Blasted Mechanism concert in Madeira Island, where I was marveled and very curious about the sound that came from the “magical tube” (the way I called it back then). Only five months after, an ex-girlfriend gave me one made of teak, like the ones you can find in fairs with instruments from all around the world. How do you think is the status of that culture in Portugal? Is it growing? In my opinion, didgeridoo in Portugal is gaining more and more fans. If we see the growth in the audience of FATT in last editions, the number of bands playing it and all the players that are emerging, certainly is a synonymous of growth. And FATT Festival is attracting more and more foreigners being even considered by many as the second best didgeridoo festival in Europe. What do you think about FATT and the roll that it has in that growth? FATT is a big vehicle for this culture to last. It’s here that many people come seeking for inspiration due to the awesome line up and all the share that exists and of course the three days of relaxation. I owe much to this festival; it was here that I met a lot of people who helped me grow with this instrument and it was here that Khayalan-trio (a music group that I’m part of) was born. People in general, there are many reference artists in my life, but I’m really stimulated when I see the joy of people earring me. I also love being surrounded by musicians, especially ones that don’t play didgeridoo and find different ways of using it seeking for new sounds and textures. We really liked your show in the first night of FATT. Did you felt the energy of the crowd in the same way that we felt yours? Definitely, in fact it was incredible the way they made me feel. The audience had a lot of impact in the choice and performance of songs, I tried to be loyal to my compositions but I extended some parts and improvised according to the vibrations that where been created. Being a part of this kind of festivals and traveling are important for your compositions? Totally, the travels that I’m doing with and for the instrument are helping me a lot improving my skills and helping me to learn more. Being a part of this kind of festivals it’s really important for me because it’s where I learn to be more confident with myself and improving my compositions and performance on stage. SouMúsica.pt would like to thank FATT Festival organization, especially Susana, for the fantastic way they received us and all the artists for spending time with us to do these interviews.